Cloud and Mobile Security: How do you find the Oracle Coherence Product version and apply a new Coherence vresion ? How do you find the Oracle Coherence Product version and apply a new Coherence vresion ? 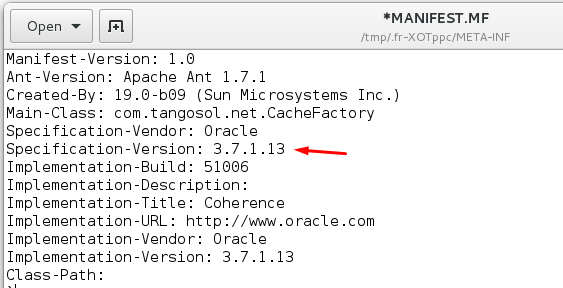 To find the exact Version of Coherence Product and to identify the patch level, you can check the MANIFEST.MF within COHERENCE_HOME/lib/coherence.jar -> META-INF directory. MANIFEST.MF shows the product version and patch level. 2. Shutdown all the servers. 3. On the each Server including the admin server, do the following. a. Unzip the contents of the patch to tmp folder. d. Backup the folder $Domain/config and all its nested contents. 8. Select the library and press the Delete button. 9. Release Configuration and apply changes. 11. Select Deployments and press the Install button. 12. Select the coherence jar in the file path. Ensure that the library name is "coherence". Hit the next button till you finish deployments. 13. Save and release the configuration. 14. Stop And Start the Admin Server. Verify the the oam_admin deployment is started. 2. Restore the $Domain/config folder.